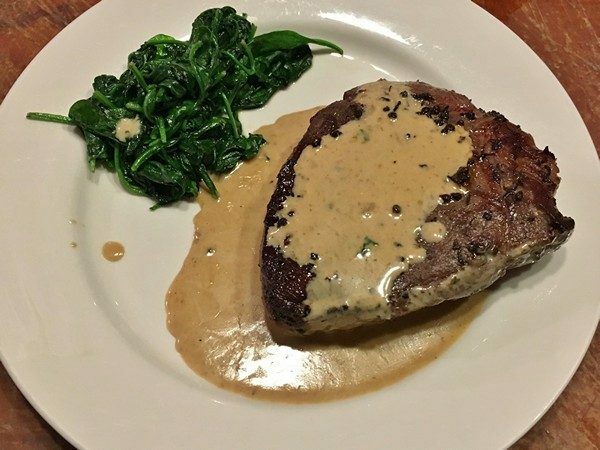 Until fairly recently, steak au poivre was one of those dishes I never understood. Too many peppercorns, disguising one of my favorite flavors – steak. 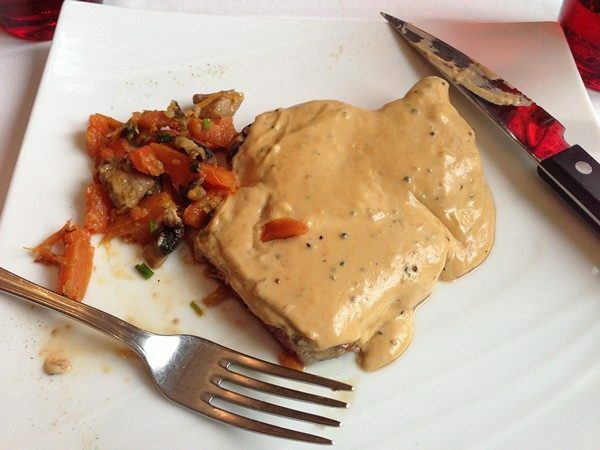 Then in Nice, I had an attitude-changing steak au poivre. A perfect amount of peppercorns, cognac and cream. Enhancing, rather than masking the essential steak flavor. Remove the steaks from the refrigerator and let come to room temperature. Sprinkle all sides with salt. 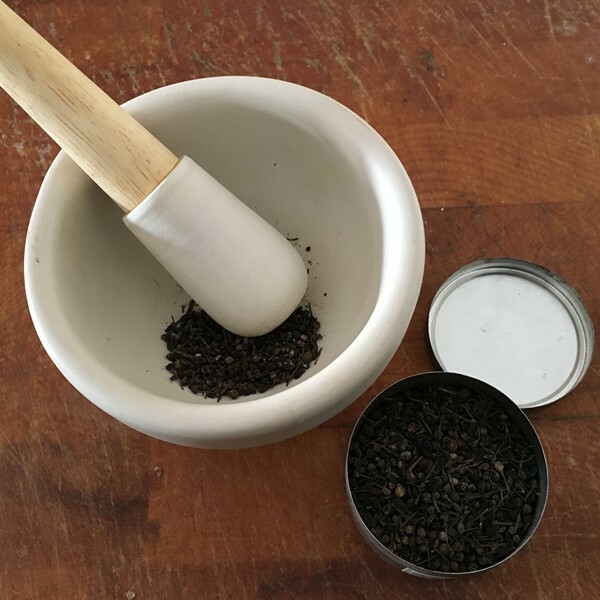 Coarsely crush the peppercorns with a mortar and pestle, or the bottom of a cast iron skillet. Spread the peppercorns evenly onto a plate. Press the steaks into the pepper until it coats all the surfaces. Set aside. In a medium skillet over medium heat, melt the butter and olive oil. As soon as the butter and oil begin to turn golden and smoke, place the steaks in the pan. For medium-rare, cook for 4 minutes on each side. Once done, remove the steaks to a plate, tent with foil and set aside. Pour off the excess fat but do not wipe or scrape the pan clean. Remove the pan from the heat, add 1/3 cup Cognac to the pan and very carefully ignite the alcohol with a long match or firestick. Gently shake pan until the flames die. Return the pan to medium heat and add the cream. Bring the mixture to a boil and whisk until the sauce coats the back of a spoon, approximately 5 to 6 minutes. Add the tablespoon of Cognac, taste and adjust the seasonings. Add the steaks back to the pan, spoon the sauce over, serve and enjoy! My verdict: First of all, be very careful when you’re setting any alcohol on fire (and always hold the pan away from yourself)!! Even though I was really paying attention, the height of the flames was a little scary. We had a mystery steak in the freezer that I used for this. Something local and not Skittle-fed. I’m not terribly fond of tenderloin and the French generally use entrecôte which is sort of similar to a strip steak. In other word, while it wasn’t the best steak, it wasn’t the steak’s fault. Because I wasn’t sure what it was, I coated it with the crushed peppercorns—some good ones I had brought back from France and cooked it sous-vide (125° for 90 minutes if you’re interested). Perfectly cooked. The sauce was another story. I’m not sure what the problem was. I used good ingredients (and followed the recipe) but it was pretty ho-hum. Certainly nowhere near life-changing! 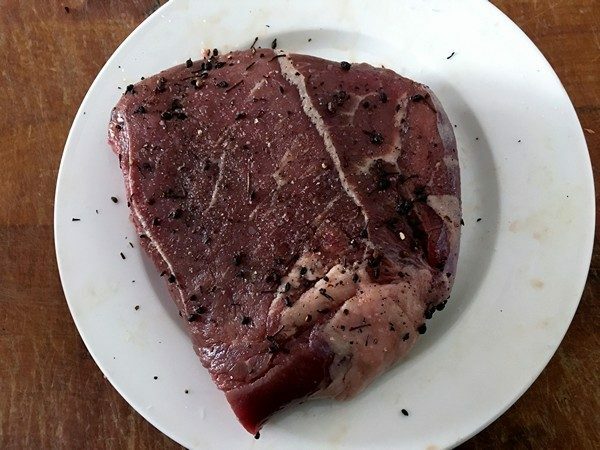 Do you have a good recipe for steak au poivre, or any suggestions? Who doesn’t like kebabs? The latest bon appetit had some great ideas and the Accidental Locavore had some local lamb (still working off the freezer). 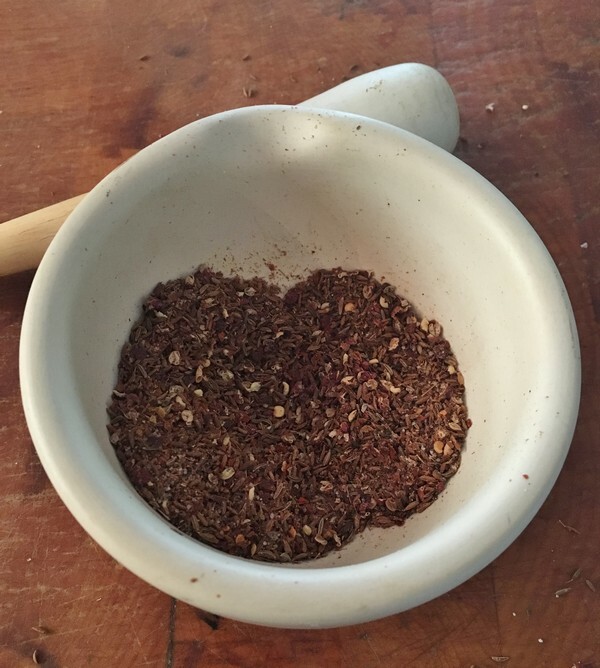 Rub: Coarsely grind cumin seeds, peppercorns, caraway seeds, red pepper flakes, sugar salt and pepper in spice mill or with mortar and pestle. Lamb: Prepare a grill for medium-high, indirect heat (for a charcoal grill, bank coals on one side of grill; for a gas grill, leave one or two burners off). Oil grates. Thread lamb onto 6–8 skewers, leaving a small gap between each piece of meat. Sprinkle generously with spice blend, pressing it onto the meat with your hands to help it adhere if needed. Grill lamb over direct heat, turning every minute or so, until browned and beginning to char in spots, about 4 minutes. Move to cooler side of grill and continue to grill until lamb is cooked to desired doneness, about 4 minutes longer for medium-rare. 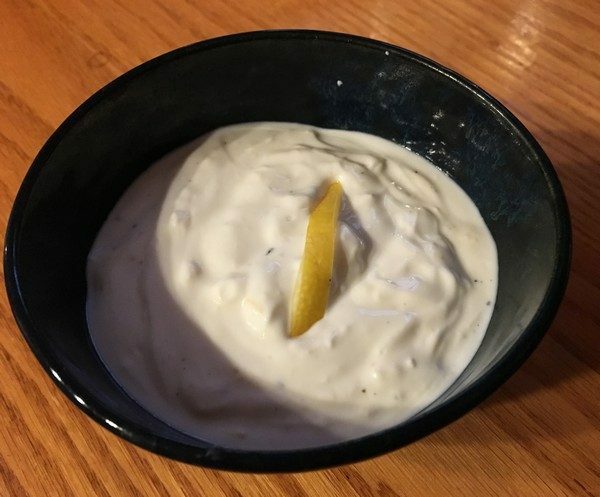 Yogurt sauce: Stir garlic, lemon zest, and lemon juice into yogurt in a small bowl to combine; season with salt and pepper. Top garlic yogurt with cracked black pepper and a little lemon zest. 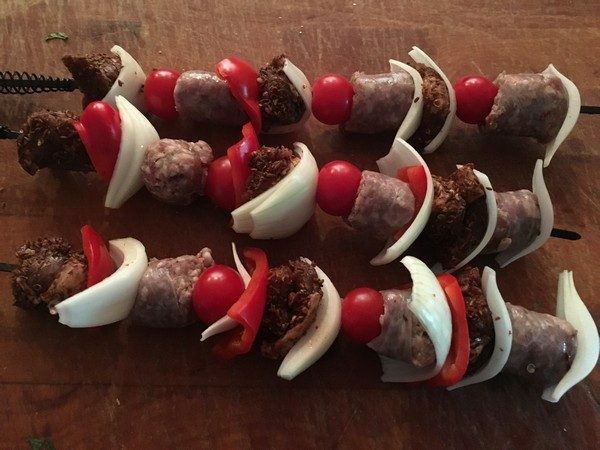 Serve with the lamb and enjoy! My verdict: If you’re looking for something to go with the baked rice, this is what we paired with it and it was a great dinner! 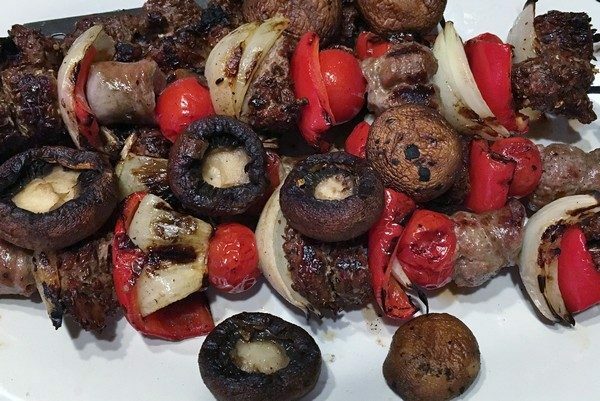 Frank doesn’t think it’s really a kebab without veggies, so he added mushrooms, red peppers, cherry tomatoes, red onions and some lamb sausage to the skewers which meant we could have fed 6 easily. I “marinated” the lamb in the rub overnight and I’m not sure if that’s why it seemed a little overly peppery. Next time, maybe start with a heaping teaspoon of Sichuan peppercorns and add accordingly. If you don’t have a grill, you know a grill pan will work just fine. The yogurt sauce is delicious (and calmed the heat from the peppercorns a bit). 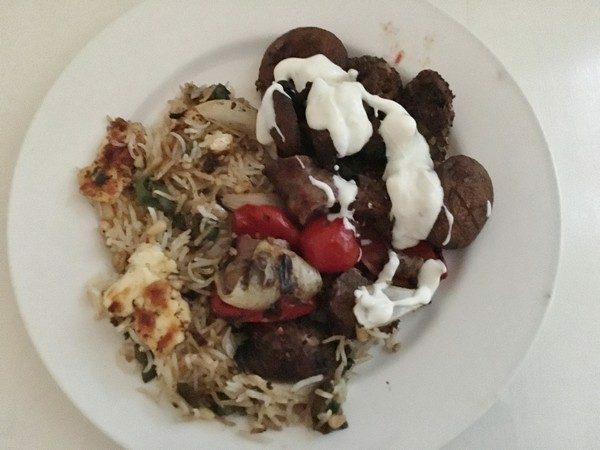 Definitely make it if you’re doing the kebabs. There was a little leftover which I added some olive oil, lemon juice, salt and pepper to and used it for salad dressing the next day. Need to remember that!